Leading a design team is less about realizing your vision than understanding what others see and helping them turn it into reality. Cadillac Exterior Design Director Robert Boniface’s combination of a psychology degree from Vanderbilt and a degree in industrial and transportation design from the College of Creative Studies may make him uniquely suited to his job of mentoring and managing creative spirits. But the lean 48-year-old took a winding route to his 2014 Free Press Automotive Leadership award for design. Boniface’s first sketches decorated his family’s refrigerator in Youngstown, Ohio, on Mother’s Day, 1971. Like most budding designers’ early work, it was inspired by Ferraris, a brand that became one of his lifelong enthusiasms. Despite that, Boniface’s artistic side took the backseat for a couple of decades until he left a job with a mutual fund and enrolled in CCS to become a grown-up car designer. Boniface’s work is marked by an intense focus on getting a vehicle’s basic proportions right before any other work begins. “It all starts with proportion,” he said. “A car can’t be beautiful if the proportions aren’t right. But if you get them right, everything else works. The role of design director at GM entails getting other disciplines such as marketing, engineering and manufacturing to buy into new designs and running interference between designers and the corporate hierarchy. “My job is to see the talents on a team and help them realize their potential,” Boniface said. “As a manager or director, it’s not your job to create clones of yourself. That may explain why Boniface brought the same enthusiasm to working on minivansthat he did to the flashier Chevrolet Camaro and Volt. A fan and collector of Italian cars, Boniface retains a boyish fascination with vintage Ferraris, Fiats and Alfa Romeos. Now with a brace of acclaimed vehicles on his résumé, Boniface concentrates on orchestrating his team on projects such as the ATS coupe that will debut at the North American International Auto Show. Boniface has a reputation for being supportive and approachable. As the designs make their way up the corporate hierarchy, Boniface makes sure his designers get credit, including praising low-level designers by name in reviews with top management, a rarity in the ego-driven world of automotive design. As vehicles’ reliability, fuel economy and features improve, he believes the importance of great design will become ever more important. The 2015 Chevrolet Volt plug-in hybrid car starts at $34,995, including an $825 destination charge, reflecting no price increase over the 2014 model, according to Chevrolet.com. The 2015 Volt is on sale now at Chevrolet dealerships. Pricing does not include any federal or state tax credits. Upgrades for the new model year include a new exterior color, OnStar with 4G LTE and a standard built in Wi-Fi hotspot, which provides a mobile hub for drivers and passengers to stay connected. The hotspot comes with a three-month/3GB data trial. The new exterior color is Iridescent Pearl Tricoat. GM said an engineering change in the battery cell used in the 2015 Volt results in an overall storage capacity increase from 16.5 to 17.1 kWh. "Customers may see a slight EV range improvement with the new battery, but the EPA-estimated range remains unchanged," the automaker said in a statement. The Volt has a range of up to 380 miles. 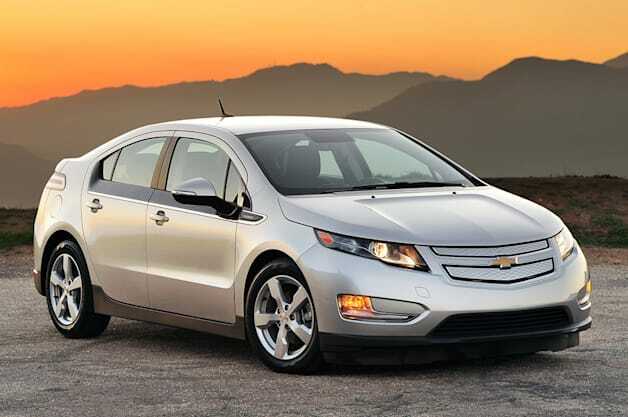 Last year, the Volt received a $5,000 price cut to make it more competitive against a growing range of entries. Key competitors to the Volt include the Ford C-Max Energi, Honda Fit EV, Nissan Leaf and Toyota Prius Plug-in Hybrid.